The New Resort Leadley’s Park will be opened to the public July 4 A Pen Picture of the Place cannot Reflect its Beauties—A Resort Equal to Any in the State. 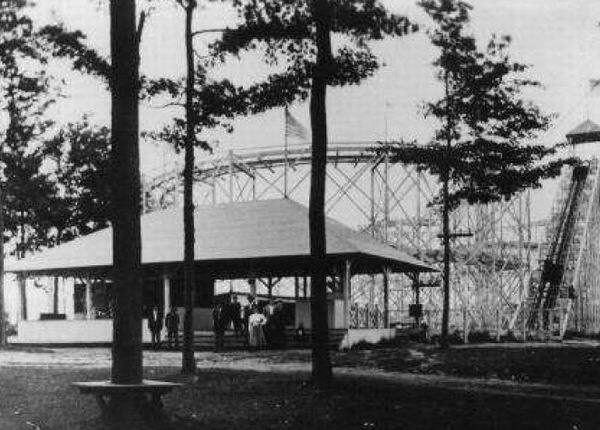 E. C. Beecher, the wide-awake superintendent of Leadley’s park, yesterday afternoon hooked up his team of spanking bays and gathering up representatives of the leading newspapers of the city, gave them a lively spin over to the park, where a thorough inspection of grounds and buildings was made. For seven years Mr.
Leadley, the proprietor has been improving this spot, during which time he has visited nearly every summer resort of any prominence in the country, with a view to completing and giving to the citizens as handsome and commodious a place for recreation as any city in the country can boast of. That he has been eminently successful in his undertaking, a single glance at the handsome resort that will be opened to the public next Monday is sufficient to convince the most skeptical. To give a pen picture of this resort that would be in keeping with the place itself is an impossibility in the small space which can be devoted to the subject, so the Republic will but briefly outline a few of the main points. On entering the grounds after a thirty minutes’ drive through as fine a county as lays outdoors, the visitor is struck with amazement at the wonderful change that has been wrought in the past few months. To the right of the entrance, approached by a broad drive through b road-branched maples, is seen the hotel, a magnificent three-story structure, with wide piazzas and broad porches, that has been built and arranged after the most modern plans and with every convenience for the expected guests. The hotel has thirty-one sleeping rooms, every one light and airy and giving a view of some portion of the grounds. The house has not yet been furnished, but from the plans shown the press representatives the furnishings will be in perfect keeping with the building. In the rear of the hotel has been built a commodious dance and banquet hall, also encircled with a wide porch, that will be well ventilated and lighted in summer and heated in winter. A large barn with stable room for forty horses is completed, while outdoor stalls for 166 teams have been built on the north and east sides of the grove. Thus it can be seen that ample provision has been made for the indoor welfare of both man and beast. But the park and grounds themselves are what attracts the eye. Heavily wooded and sloping gradually to the broad river that runs along the south side, they are beautiful in the extreme. The grounds are dotted with numerous tables and seats for the use of guests, while long tables and benches for the use of picnic parties are being put up. Near the river and next to the road have been made two artificial lakes, one fed by springs and the other by an artesian well, the latter drilled into the solid rock 166 feet, furnishing an unlimited supply of the purest drinking water. Along the shore of the river, which lays from three to five feet below the bank, has been built a hard road, three-quarters of a mile long, stretching east of the park, as a driveway and track for bicycles. Many other drives carry one to any part of the park. 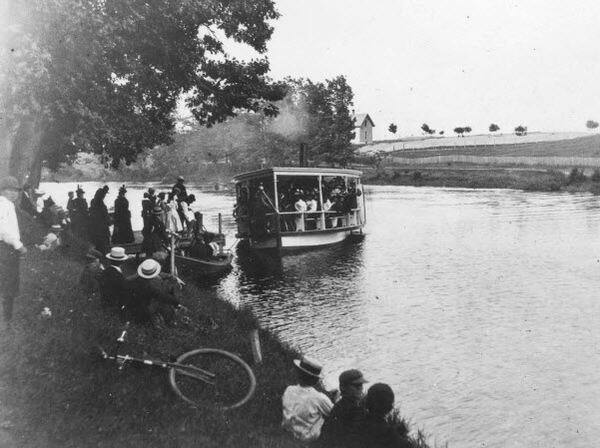 A photograph of Waverly Pack, the successor to Leadley’s Park One mile east of the hotel lies a handsome wooded island, that has been named “Sycamore island,” and to which the steamer will make regular trips. For a pleasure trip the boat will make the trip around this island, giving a boat ride of two miles from the hotel and return. The river the entire distance is from four to eight feet deep and makes a magnificent course for small crafts, of which there will be plenty. Water is piped to all parts of the grounds from deep well and pumped by an enormous windmill. Stands, where can be purchased edibles and soft drinks, will also be in charge of polite attendants, and, in fact, every possible detail for the comfort of guests has been attended to. A bath house is being built and placed at a point where water at any desired depth can be secured by bathers. E. C.
Beecher, who has been secured by Mr. Leadley as general manager of the entire business, is an experienced caterer, having had charge of some of the best resort hotels in the state. He is affable and courteous, fat and jolly, and in fact the ideal “mine host,” and will no doubt become very popular with the patrons of the Leadley resort. Said he last evening: “This place is to be run in the interest of the public. I will just as cheerfully get up out of my bed at 3 o’clock in the morning to get up a banquet or a single meal as to serve one at 3 o’clock in the afternoon. We shall have telephone connection with the city, and a few moments’ notice is all that will be required to have a large party taken care of. ” No liquors of any description will be served on the grounds, and brawlers and loafers will not be permitted the privileges of the park on any consideration. “We expect to run the place,” said Mr.
Beecher, “so that the finest people of the city can come and see us, and espcial care will be taken that ladies may patronize the resort and feel free from insult and restraint. ” Mr. Leadley has all the material on the ground for the building of the two locks near the fair ground and expects to have the same completed in about three weeks. The steamer will then make regular trips to the park. Until that time buses will make the trip at stated hours between Michigan avenue and the park. The grounds will be lighted at night with hundreds of lanterns and gasoline lamps, as well as the river course half way to the island. S. R.
The Michigan Princess had nothing to do with Waverly park as stated. It is owned by The Chamberlains from Grand Ledge. It is beautful and lots of fun. I have a post card of waverly park that I bought at a flea market. Would you like me to scan it and send it to you?. from the webmaster: yes. The below link leads to the last remaining portion/ghost of waverly park. It''s a river boat on the Grand River called the Michigan Princess. This boat was part of Waverly Park and was resurrected from the dead by a family who uses it for dinner cruises / parties on Lansing''s Grand River. Here is the link. This park was on the Grand River, bordered on the east by the Lansing Boat Club which is now the site of a high end subdivision. It operated between 1884 and 1917. There appears to be some metal posts in the ground on the site that may be remnants of the old park. 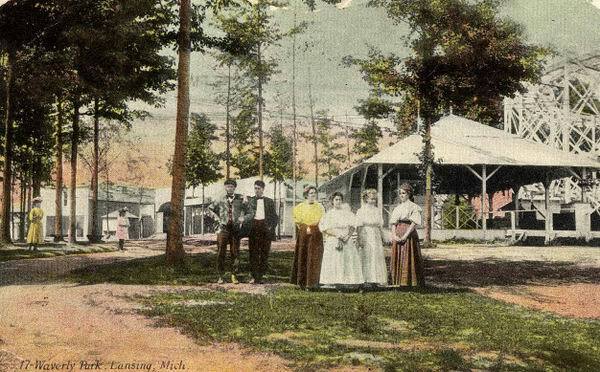 Typical of that era, the park was accessible via trolley which connected to downtown Lansing. 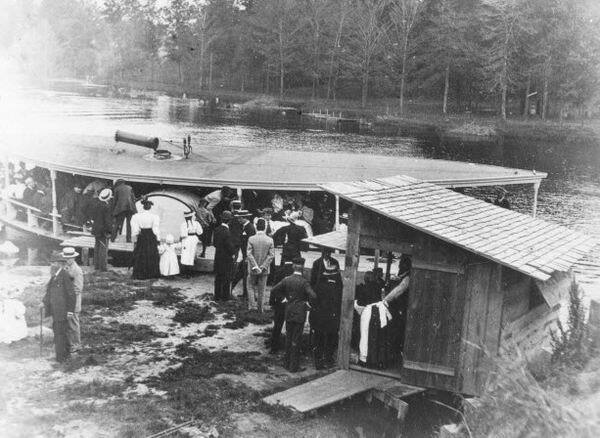 There were also steamboats along the river that provided transport to the park with one dock being located on Logan Street (now MLK). The park was also known as Leadley's Park. There was a large pavilion, also typical of the parks of that time. And of course a boathouse. More info is available in the book Old Lansing Town edited by Hazel Proctor.